Because of Christ, we have every reason to pray in faith and hope! Because Christ, our Great High Priest has sprinkled the Mercy Seat with His own shed blood, we can now come boldly to the throne of grace and lay hold of mercy and find grace to help in time of need. Seeing then that we have a great High Priest who has passed through the heavens, Jesus the Son of God, let us hold fast our confession. For we do not have a High Priest who cannot sympathize with our weaknesses, but was in all points tempted as we are, yet without sin. Let us therefore come boldly to the throne of grace, that we may obtain mercy and find grace to help in time of need (Hebrews 4:14–16, NKJV). In Christ we have full access to the Father! We are forgiven and redeemed. We are loved and accepted. We have the full measure of God’s embrace. He has given us Christ! What then will He withhold? 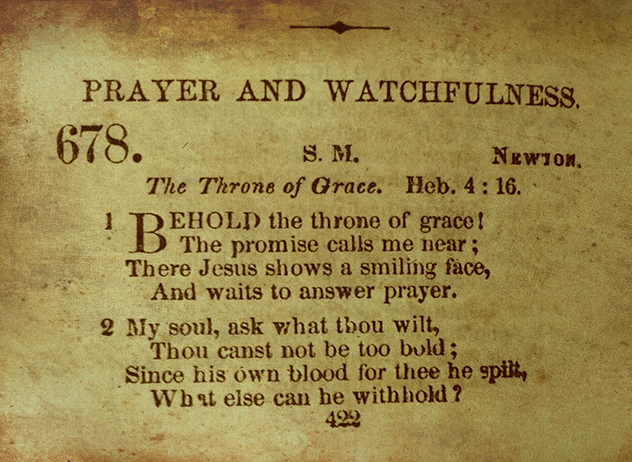 John Newton’s hymn “Behold the Throne of Grace” celebrates the promise we have of bold access to the presence of God in Christ. It encourages us to remember the promise and preach it to our own souls. In Christ God freely gives us all things, not so we can obtain and cling to “the world’s poor toys” but so we can have and cling to Christ, who is our greatest need and ultimate joy. The hymn is from Book 1 (“On Selected Texts of Scripture”) of the Olney Hymns published in 1779 by John Newton and William Cowper. It is included along with two other hymns under the Scripture text: “Ask what I shall give thee” (1 Kings 3:5). Download free sheet music (PDF), including a guitar chord charts and arrangements of the hymn tune STATE STREET for classical guitar and for instrumental ensemble.